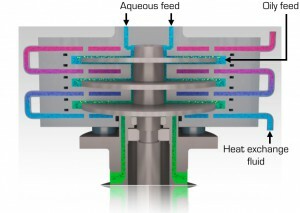 The SpinPro is unique in the field of emulsification as it allows for a high degree of freedom on the amount of shear that is applied to the emulsifying fluids, independent of the total throughput through the system. 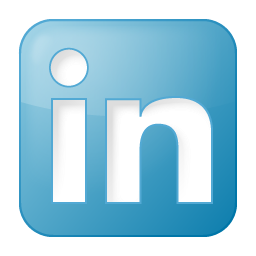 This results in constant droplet size distribution at the outlet with a high degree of control. 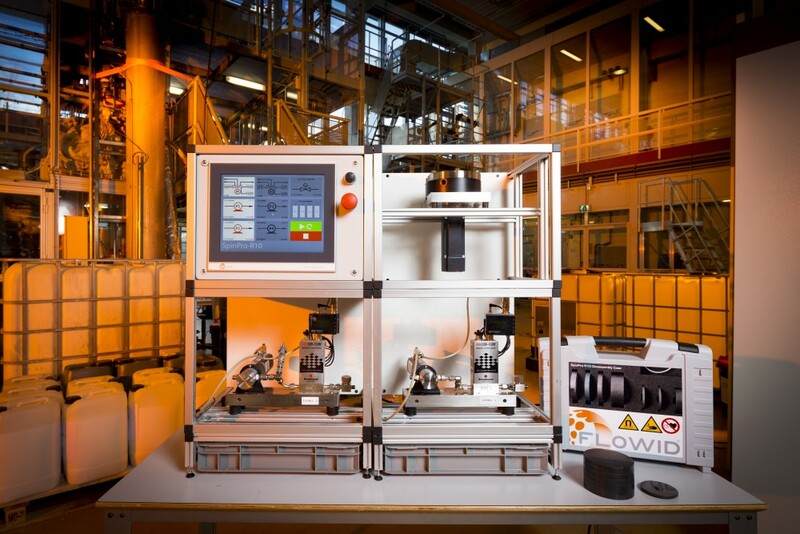 Recently, Flowid has demonstrated that emulsions can readily be made with droplet sizes that can be fine-tuned down to 8 μm in diameter by simply increasing the disc speed up to 3800 rpm. There was no significant effect of flow rate on the droplet size distribution when increasing the total throughput from 50 L/hr to 100 L/hr. Due to the modular design of the SpinPro, this absence of influence is expected to persist for flow rates of up to 600 L/hr, being the maximum design capacity of the SpinPro R300. 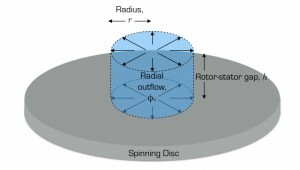 Conceptually, the fluid inside a single rotor-stator cavity in the SpinPro R300 can be divided into two distinct regions, with differing hydrodynamics. Near the rotating shaft, the liquid flow is mostly dominated by the net flow through the system, φv [m3/s], see Figure 1.
rotating disc and the stationary disc (not depicted) in a SpinPro R300. Near the shaft the average liquid velocity thus scales with φv/r, while at larger radii the velocity becomes proportional to the radius, but independent of the total flow rate. At the same time, the shear rates are highest at the rim of the disc. This technical feature of the SpinPro has recently been exploited to its full potential for a project we did for an industrial partner. 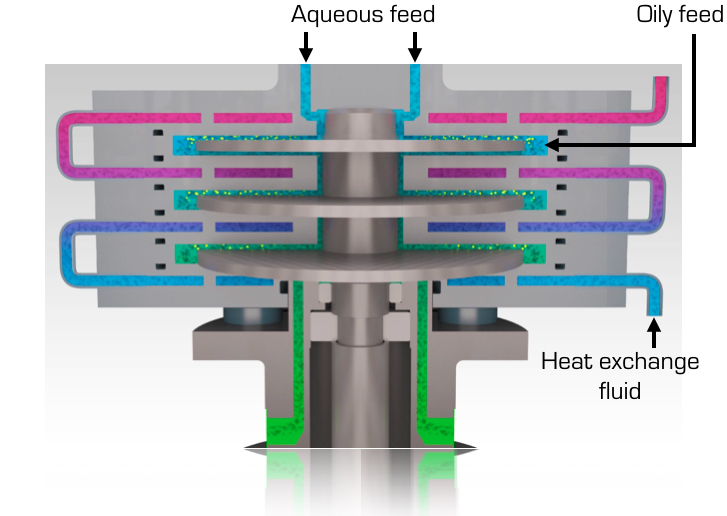 During the experiments performed, an aqueous phase was fed through the reactor, while an oily phase was fed through small orifices in the concentric shroud of the first stage, as depicted in Figure 2. Samples were collected at the outlet of the SpinPro and were analysed using Laser Diffraction. 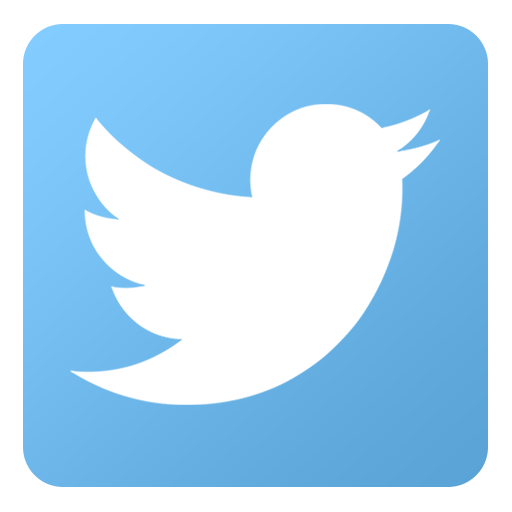 connected in counter-current flow for finely controlling the temperature. 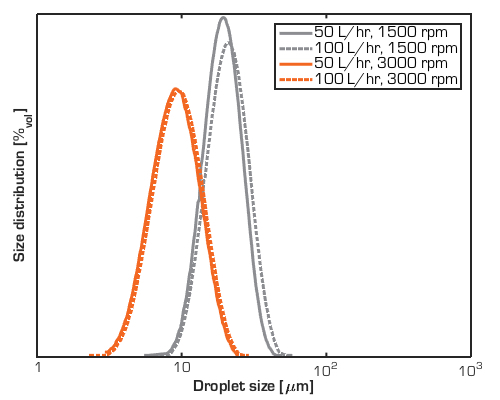 At 50 L/hr, a clear trend can be observed in the droplet size as a function of disc speed, as depicted in Figure 3. 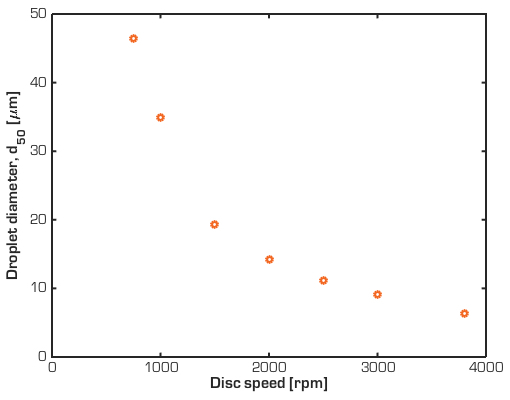 Moreover, when the droplet size distribution at 50 L/hr and 100 L/hr is compared at similar disc speeds, a very narrow overlap between the curves is observed, as can be seen in Figure 4.
in the SpinPro by simply tuning the speed of the rotating disc. the droplet diameter, as there is negligible effect of flow rate. 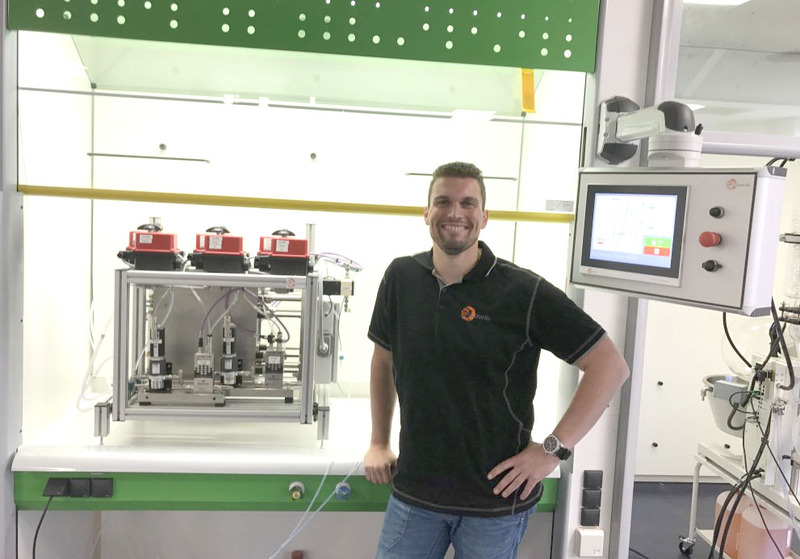 Using the SpinPro, it is thus possible to have fine control over droplet size in emulsification processes, regardless of the flow rates through the system. Droplets can be made from the range of the order 102 μm down to 8 μm in diameter by increasing the disc speed up to 3800 rpm. 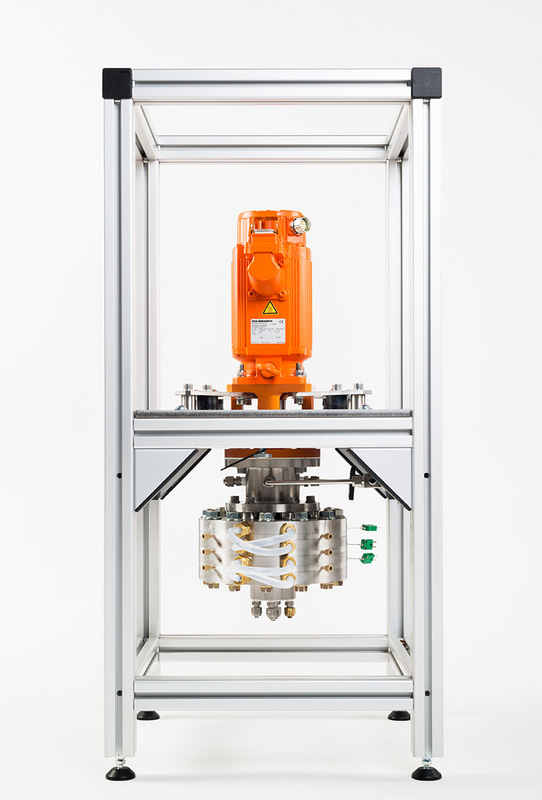 Moreover, there is no effect of the total throughput through the SpinPro so that shear, and thus droplet size, is independent from production capacity up to at least 600 L/hr. 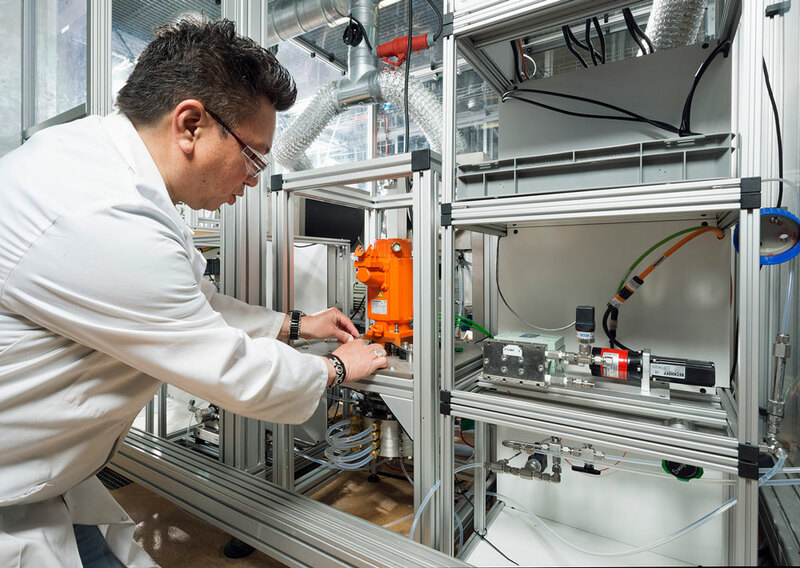 Flow Chemistry Pavilion – A first for visitors to ACHEMA 2018!